The motivation to this work relies on nowadays trend to incorporate complete systems in portable and highly autonomous electronic equipment, i.e., longer-lasting battery-powered circuitry, to assist the everyday life of populations. Indeed, the need for low-power circuits is directly related with the energy efficiency of the amplifiers, used in the different building blocks employed in an analog processing chain of a given circuit or electronic system. In fact, amplifiers are fundamental components, not only in analog but also in digital and mixed-signal processing. H. Wei, et al., “An 8-b 400-MS/s 2-b-Per-Cycle SAR ADC With Resistive DAC,” in IEEE Journal of Solid-State Circuits, Vol. 47, Issue 11, Page(s): 2535–2763, Nov. 2012. DOI: https://doi.org/10.1109/JSSC.2012.2214181. 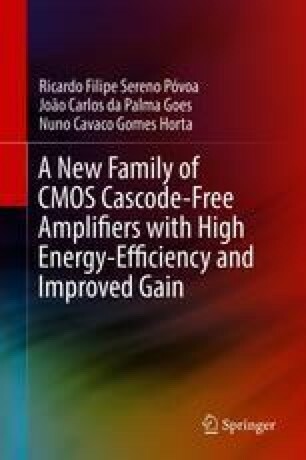 M. Figueiredo, et al., “Reference-Free CMOS Pipeline Analog-to-Digital Converters,” Springer, 2013. DOI: https://doi.org/10.1007/978-1-4614-3467-2-2. V. Kopta, et al., “An Approximate Zero IF FM-UWB Receiver for High Density Wireless Sensor Networks,” in IEEE Transactions on Microwave Theory and Techniques, Vol 65, Issue 2, Page(s): 374–385, Feb. 2017. DOI: https://doi.org/10.1109/TMTT.2016.2645568. W. Gao, et al., “A Novel Front-End ASIC With Post Digital Filtering and Calibration for CZT-Based PET Detector,” in Advancements in Nuclear Instrumentation Measurement Methods and their Applications (ANIMMA), Page(s): 1–5, Apr. 2015. DOI: https://doi.org/10.1109/ANIMMA.2015.7465547. L. Atzori, et al., “The Internet of Things: A Survey,” in Elsevier Computer Networks, Vol. 54, Issue 15, Page(s): 2787–2805, Oct. 2010. DOI: https://doi.org/10.1016/j.comnet.2010.05.010. D. Giusto, et al., “The Internet of Things,” Springer, 2010. DOI: https://doi.org/10.1007/978-1-4419-1674-7. D. Uckelmann, et al., “An Architectural Approach towards the Future Internet of Things,” Springer. Mar. 2011. DOI: https://doi.org/10.1007/978-3-642-19157-2_1. J. Pekarik, et al., “RFCAMOS Technology from 0.25um to 65nm: The State of the Art,” in IEEE Custom Integrated Circuits Conference, Page(s): 217–224, Oct. 2004. DOI: https://doi.org/10.1109/CICC.2004.1358782. N. Lourenço, et al., “AIDA: Robust Analog Circuit-Level Sizing and In-Circuit Layout Generation,” in Integration, the VLSI Journal, 2016. DOI: https://doi.org/10.1016/j.vlsi.2016.04.009.